LightspeedST: 5. The Movie, copyright 2012, Reginald Brooks. All rights reserved. ©2012, Reginald Brooks. All rights reserved. mass…brought out as an expression of the spin vector asymmetry. The boson ST units, with their whole-integer spin may deconstruct-decay-reconfigure by various means, allowing for the possibility that a different configuration of the ST unit formation vectors…and specifically those responsible for the spin (spin-vectors)…may occur in which the symmetry and resonance of the boson is broken, giving rise to ST units with mass known as the fermions…a class of subatomic particles with fractional spin. The light fermions, known as leptons, are outside the nucleus of any atom and do not experience the strong nuclear force. Best example is the electron and its associated neutrino, the latter being almost pure spin and little or no mass. The heavier fermions, known as baryons, do experience the nuclear force through the action of gluons on the fractionally-charged and -spin quarks. The proton and neutron…being two orientations of the same three up and down quark combinations are the best examples. 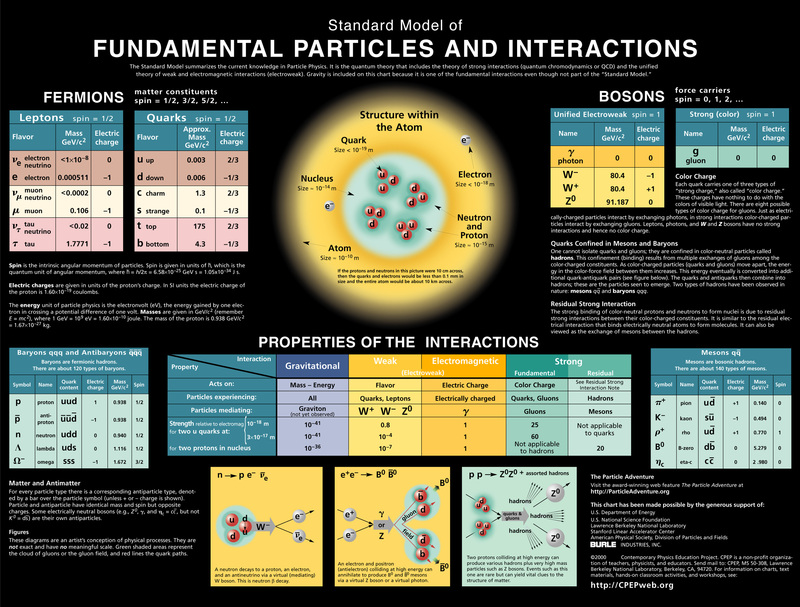 Additionally, there are other two-quark combination particles that are bosons…not fermions…having integral spin, yet experiencing the strong force. Strong force experiencing particles are referred to as hadrons. The ST quantum unit P-P out to a spatial distance defined by its λ. It does so at a temporal frequency rate of v, such that it obeys c=λv, or ST=λv. As each ST pulse collapses back to it singularity (Ⓢ) below the Planck Event Horizon (PEH), it has moved that distance λ in the time of 1/v (as time as seconds = 1/v = 1/cycles/s = s/cycle or seconds). The photon (ɣ) not only follows this same P-P formation dynamic to achieve lightspeed, it is actually identical…as in one and the same…to the formation of the ST quantum unit…ɣ=ST. Both, as ɣ=ST, behave as directionally-dependent vectors…subsequently creating a scaler ST by the interaction with other ɣ=ST quanta sources, much like a field of machine guns mounted on spinning turrets. The radiating scaler-like wave fields of bullet projectile quanta created are, nonetheless, created by individual vector projectile quantum units, the ɣ=ST units. The wave-particle duality of the photon corresponds to the wave-particle duality of ST.
Each ɣ=ST P-P individually acts like a vector particle in that its energy and momentum are directionally-dependent as it is expressed as displacement…movement…over elapsed time. Collectively, the interaction of multiple ɣ=ST quanta act like a scalar wave in that the net energy and momentum resulting from the interplay of constructive and destructive interference dynamics demonstrates classic wave behavior. In our spinning machine gun allegory, each bullet represents a single ɣ=ST quantum unit. All of ST…all light, EM, gravity…all energy…is represented by those bullet particle quanta moving at lightspeed and the dynamic interactional wave patterns resulting from their interference. The allegory becoming the metaphor for the actual ɣ=ST quanta can only be taken so far. As each bullet of ɣ=ST can be said to represent a quantum unit of energy (Planck’s Energy, E=hv), and, as always moving at lightspeed, the fixed bullet size (λ) and constant rate of firing (v) does not account for c=λv under various energies. The ɣ=ST quanta…while always delivering a single Planck Quantum unit of Energy, and , always moving at lightspeed (c), they in fact do so by flexibly proportioning their size (λ) and P-P frequency rate (v) to always equal c, as c=λv. These ɣ=ST bullets can lengthen/contract their λ and v to both meet the required need of lightspeed and satisfy the energy context that they exist within. So if ɣ=ST quanta come in different sizes, pulse-propagating at different rates and are ubiquitous…where did and do they come from? Lightspeed c=λv is well established. Now we are saying that the photon (ɣ), traveling at lightspeed, is actually formed by the P-P creation of individual ST unit quanta…ɣ=ST. The ST quanta are formed at lightspeed…ST=λv…and the actual motion of the ɣ is in its formation as a ST unit quanta. It moves forward a net distance equal to the λ of the ST unit and at a rate, or frequency (v), such that the product of the two always equals c=λv. Below the PEH of every ɣ=ST unit quanta is a singularity (Ⓢ) that is the source of the P-P. Its energy defines the energy…and thus the size (λ) of the spatial displacement and the time dilation (v)…locally for each ɣ=ST unit quanta. As noted, above the PEH, into “OD” reality, all generated ɣ=ST unit quanta move at lightspeed, are massless and changeless with a net spin-vector expression of spin=1 for the photon and spin=2 for the graviton. The massive ST units move at sub-lightspeed, any net charge expression is always a whole integer multiple and the net spin-vector expression is fractional. Given the Conservation of Lightspeed=Conservation of ST=Conservation of *Energy…how is all this possible? How is it maintained? Who does the accounting? The disposition of the formation-vectors of ST unit quanta makes sense when in the context of a + “OD” reality space, and, a - “infinity” space…each emanating out from the Ⓢ past the PEH…the former available for us to experience in “OD” + space, the other not, being hidden in - “infinity” space. It is the Ⓢ that both connects the two spaces locally and connects the overall energy over time. They are linked as ST. It is the Ⓢ of each ST unit quanta that acts as fractal-derivatives of the original Super-Mama Higgs Boson Ⓢ. The energy of the whole deconstructs-decays-reconfigures and gets re-disbursed over the many child ɣ=ST and massive ST unit quanta. The sum (∑) of which is always conserved. The communication within the Ⓢ substratum services the Conservation Laws by adding energy (mass) density here…a.k.a. Dark Matter…and as a consequence diluting mass (energy) density there…a.k.a. Dark Energy. Now everyone is happy if not at least reconciled to the fairness of proportionment. It all comes down to c=λv=ST and the Conservation of SpaceTime=The Conservation of *Energy. Viewing Notes: Within "The Movie Script" section, CLICK the Blue Boxes in order. There are 50 short videos in the a,b,c and/or 1,2,3,... boxes along the way.Click them in order to follow text with video. CORRECTION~~~IMPORTANT NOTE~~~ The “Movies” have a labeling error. Within the various videos, the “+” and “-” labels for the horizontal (AV) axis were mistakenly transposed - reversed - from their correct position. The should read as: “-” LEFT, and “+” RIGHT on the horizontal (AV) axis. Please consult the text, images and references to see the correct version labeling of the horizontal (AV) axis. These are General references. See Links for Specific references. •	Page 1: The FARNIE art classification scheme. •	Page 2: PIN: Pattern in Number...from primes to DNA. •	Page 2b: Butterfly Primes...let the beauty seep in. •	Page 2c: Butterfly Prime Directive...metamorphosis. •	Page 2d: Butterfly Prime Determinant Number Array (DNA) ~conspicuous abstinence~. •	Page 3: GoDNA: the Geometry of DNA (axial view) revealed. •	Page 4: SCoDNA: the Structure and Chemistry of DNA (axial view). •	Page 5a: Dark-Dark-Light: Dark Matter = Dark Energy (the inverse of) . •	Page 5b: The History of the Universe in Scalar Graphics . •	Page 5c: The History of the Universe - update- "The Big Void" . •	Page 6: The LUFE Matrix. •	Page 7: The LUFE Matrix Supplement. •	Page 8: The LUFE Matrix: Infinite Dimensions. Ratios of the Electron and the Proton. Common units and The LUFE Matrix. ~Appendix Set II:~Fundamental Constant ~5. The Atom---Mass variation in the electron by photon absorption, and, The Inverse Square Law. •	Page 14: GoMAC: The Geometry of Music And Color, Parts II and III. •	Page 18: Numbers Of Inevitability ~ Let's do a number on that! Copyright 2013-14, Reginald Brooks, Brooks Design. All rights reserved. Permission is hereby granted for single copies to be made for personal, non-commercial use for students and teachers of schools, colleges and universities provided that: either the entire paper, including figures and tables, is kept intact; or, any extracts of the text, or figures or tables (in part or whole), be properly and visibly cited as to authorship and source.